Electrical Engineering Professor Donald Keller, Ph.D., P.E., works closely with his students. Beginning fall 2016, Point Park University in Downtown Pittsburgh will offer a Bachelor of Science degree program in the thriving field of electrical engineering. Point Park's new program combines rigorous theoretical study in electrical engineering with extensive laboratory experience. "Our program educates students in the timeless fundamentals of science, mathematics and electrical engineering while incorporating specific technology to illustrate these fundamentals," remarked Donald Keller, Ph.D., P.E., professor of electrical engineering. 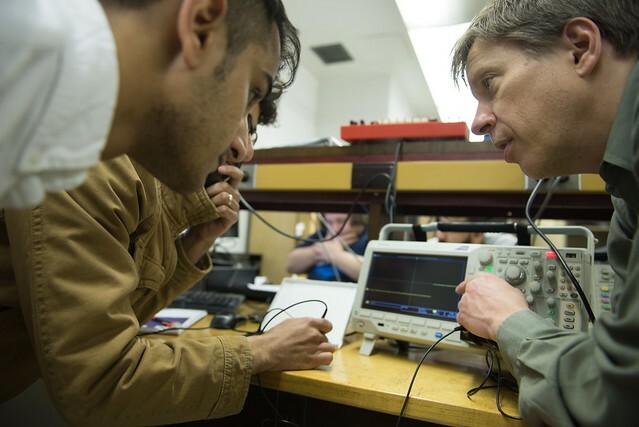 According to Keller, every electrical engineering course at Point Park includes a laboratory component to reinforce theory with hands-on practice. Additionally, students have the unique opportunity to take electrical engineering courses their first semester. "Students hit the ground running here and get to know us very well by the time they graduate," said Gregg Johnson, Ph.D., associate professor of electrical engineering and chair of the NSET department. "Electrical engineering is a big field with myriad specialties. Our curriculum is designed to give our students a solid footing in the fundamentals, but with enough electives to explore an area of personal interest," added Johnson. "The areas of electrical power, digital electronics and communications continue to be in strong demand for qualified electrical engineering graduates," explained Keller. "Upon graduation, our students are well prepared for professional practice in the workplace." Learn more about the electrical engineering program at Point Park University including degree requirements, the typical Bachelor of Science course sequence and career opportunities. Prospective incoming freshmen and transfer students are currently being accepted into the electrical engineering program for the fall 2016 term. Request more information, schedule a campus visit or apply online.